Over the last couple of years, I have explored in this column how Sports Direct’s consumer perception has shifted as a consequence of a series of investigations, negative headlines and less positive financial results – but also how its value for money offer remains appealing to its core customer base. 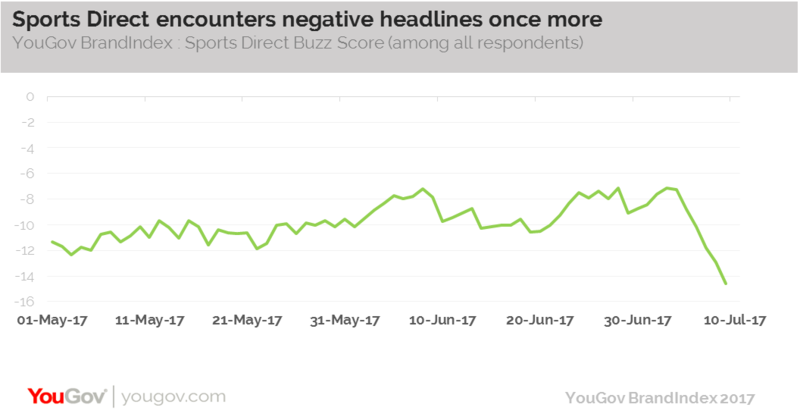 Following Ashley’s appearance in court Sports Direct’s Buzz score (whether a person has heard something positive or negative about the brand) once again dropped sharply, falling from -7 to -14 over the last week. The retailer had been making progress on this front – its score steadily rising since the turn of the year. The positive news for Sports Direct is that as the court case involving its founder continues, its overall Impression score has only dropped by three points (from -17 to -20) – far less than when allegations relating to working practices in its warehouse were revealed. But crucially, its Impression score has not shifted at all among those that would consider shopping at the retailer. Consumers – and indeed investors – may well have priced in the ongoing negative press around both Sports Direct and its founder and have separated it from their wider view of the business more generally. For those choosing to shop at the brand’s stores, the assumption is that they will still be enticed to open their wallets by the prices on show. Indeed, Sports Direct’s value for money metric highlights this – currently sitting at +10 among all respondents. This is the highest it has been since September 2015. This has had an impact on Sports Direct’s Purchase Consideration score – looking at the brand’s performance since the turn of the year we see gradual improvement, so much so that its score has increased by 5 points, from +14 to +19. With household budgets tightening, the retailer is well placed to capitalise – despite any negative headlines generated by its most famous figurehead.